The British High Commission or British Consulate in Bangladesh is located in ‘Embassy Row’ in Dhaka Bangladesh. 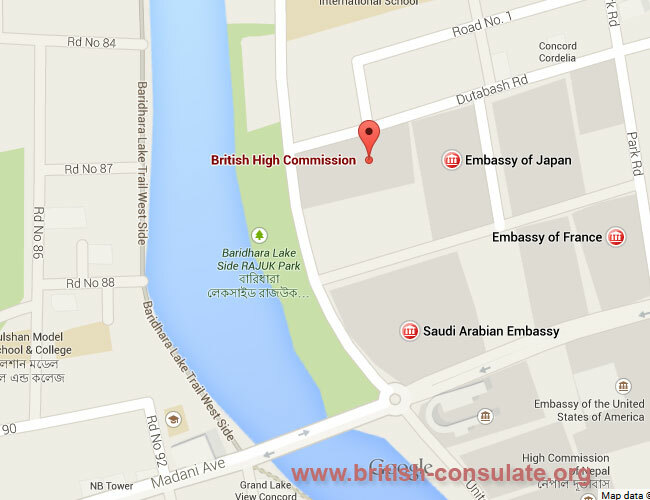 The British High Commission is close to the Japanese Embassy in Dhaka. The Thai Embassy in Bangladesh is also close by. We have listed their telephone number for the British High Commission in Dhaka below with a map and the street address. If you are going in person then also find their opening hours at the Consulate for consular services. If you want to apply for a new British passport, apply for a visitors visa for your friend, fiancee visa or a marriage visa then this is where the process starts. Call them today or email them on the details listed below. If you are wanting to contact or to visit the British embassy in Dhaka then you should note the days when the embassy is closed for a public holiday. This could be a British or a local holiday so always check. A good example it the National Day of Bangladesh which is a holiday even though not a British one. Call or best yet email them before you visit their offices. The following is the average time taken to process a UK visa out of the Dhaka Embassy. The stats are collected by the UK Border Agency who keep track of the quality of service for issuing a UK visa to a foreign national abroad. Check the type of visa you have applied or are applying for and note what your average time for the British visa would be.